Messier 87 (M87) is a giant galaxy, situated right at the centre of one of the largest and nearest clusters of galaxies, the Virgo Cluster; its distance is about 50 million light-years) and several thousand galaxies belong to this cluster, but none is brighter and heavier than Messier 87. Already in 1918, photos showed the presence of a jet in M87, i.e. a long and thin feature, extending in a westerly direction from the centre of this galaxy. This jet bears witness to the violent processes at the centre of M87 and has led many astronomers to think that there is a giant black hole in there. Recent observations with the Hubble Space Telescope have strengthened this suspicion. M87 is also special in that it belongs to a select group of radio-emitting galaxies. The jet in particular emits intense radio-emission which is caused by the interaction between a strong magnetic field and very energetic particles ejected from the centre. The same observations have also indicated the presence of a much more diffuse, rather symmetric radio-emission from much of the galaxy. However, contrary to most other radio galaxies, there has been no indication of the existence in M87 of a counter-jet in the opposite, eastward direction. This seemed to show that M87 must be a rather peculiar case and perhaps very different from other radio-galaxies with jets. Now, however, a group of ESO astronomers has used the 2.5 meter Nordic Optical Telescope (NOT) on the island of La Palma (Canary Islands, Spain) to observe the M87 galaxy under very good conditions. Thanks to the excellent optical quality of this telescope, it was for the first time possible to obtain optical images which clearly show the presence of a counter-jet; one of the images accompanies this Press Release. The new observations indicate that in this sense M87 is less extraordinary than thought before. 11 light-year = 9,460,000,000,000 km. 2The group consists of Palle M0ller (originally from Copenhagen University, Denmark), Massimo Stiavelli (also Scuola Normale Superiore, Pisa, Italy) and Werner W. Zeilinger (originally Astronomisches Institut cler Universitat Wien, Austria, and Department of Astronomy, University of Padova, Italy) . When photographed in visual light, the galaxy M87 is one of the brightest elliptically shaped galaxies. It also emits strongly at radiofrequencies and is as such known as the radio-source Virgo A, one of the strongest in the sky. M87 is about ten times brighter than the galaxy in which we live, the Milky Way, and it contains more than one thousand billion stars like our Sun. Astronomers subdivide radiogalaxies into two classes, depending on their radio¬brightness and also the degree of symmetry of the radio-emission. The radiation from galaxies of Type I is less powerful and less symmetric than that from galaxies of Type II. Until now, M87 has been classified as of class I, mainly because of its asymmetrically placed, but otherwise prominent single jet which stretches almost 6000 light-years to the west from the centre. It is now believed that all the bright and symmetric radio-galaxies of Type II contain two diametrically opposite, powerful jets of energetic particles, mostly electrons which move with velocities very near to that of light and carry great quantities of energy from the centres to the outer regions of the galaxies. The radio emission observed from the jets is synchrotron radiation, i.e. the electromagnetic radiation emitted when the associated, strong magnetic field forces the energetic electrons to move in spiral-shaped orbits. Although most of the synchrotron radiation is emitted as radio waves, it has also been possible to observe this radiation at optical wavelengths in a few Type II radio galaxies. 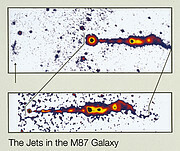 The radio-observations of M87 show a diffuse emission on the other side of the main jet, but do not provide clear evidence of the existence of a counter-jet. Earlier optical observations never showed anything either. However, by means of new, excellent images which were obtained under near-perfect observing conditions at the NOT telescope, the ESO astronomers have now detected an arc-shaped filament to the East of the centre of M87, i.e. in the opposite direction of the main jet. Assuming that the distance of M87 is 50 million light-years, the angular distance of the arc from the centre of M87 (~ 24 arcseconds) corresponds to about 6000 light-years. This is about 1/4 of the distance of the Sun from the centre of the Milky Way Galaxy. The new images of M87 were obtained in different wavelength bands and it was therefore possible to accurately measure the colour of the arc-shaped nebula. The astronomers found that it is rather red and very closely corresponds to what would be expected from synchrotron emission. They conclude that the arc is shining by the same physical process that is responsible for the radio emission. Complementary high quality blue images of M87 were obtained at the 2.2 metre ESO IMPI telescope at La Silla. In collaboration with American radioastronomer John Biretta (National Radio Astronomy Observatory, Socorro, New Mexico, USA), the new optical data were compared in detail to radio images obtained with the Very Large Array radiotelescope. The optical emission is observed at the exact location of a "hot radio spot", another strong indication of a common origin. The astronomers conclude that the counter-jet has the form of a hollow cone that is directed towards the far part of M87. The cone is surrounded by interstellar material through which the counter-jet has excavated its present path. The energetic electrons move a long distance inside the cone without emitting much energy and the corresponding part of the counter-jet is therefore not visible. However, at the position of the arc-like structure, the fast moving electrons reach the end of the cone and are suddenly piled up and compress the interstellar medium here so that strong synchrotron radiation is emitted. In this way the counter-jet becomes "visible" here and Can be observed in optical light. It can be shown that if the counter-jet would be "switched off", the arc-like filament would stop shining approximately 1500 years after the last electrons arrive; this is a very short period in astronomical terms. The fact that it is actually observed is therefore a strong indication that the counter-jet has been active for a long time and continues to be active. 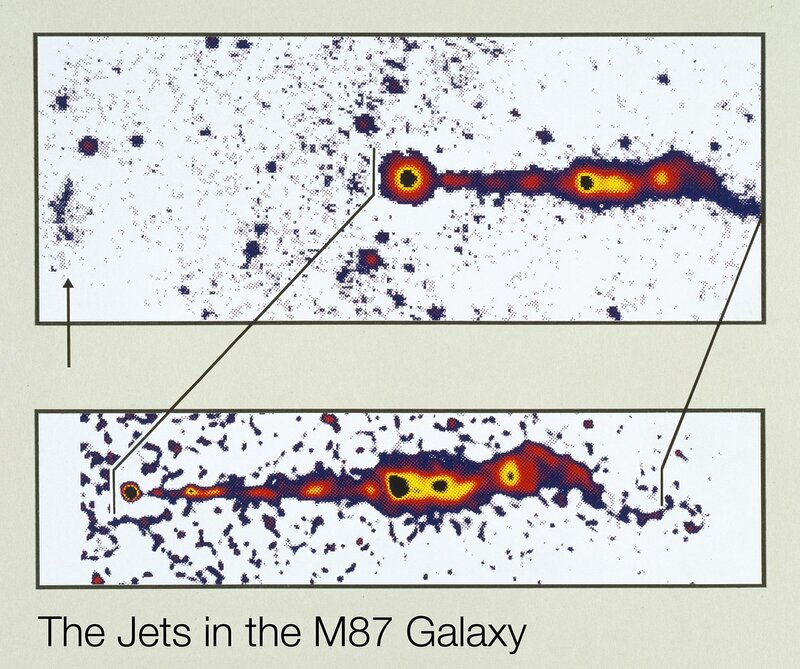 The optical images thus prove the existence of a counter-jet in M87 supporting that this galaxy is, after all, quite similar to other radiogalaxies which harbour double jets. Further studies are now needed to better understand exactly how the counter-jet can transport the large amounts of energy needed to account for the observed synchrotron radiation over such large distances without being detectable itself. The new results are presented in detail in a scientific paper which will appear 10 in the February 27 issue of the scientific journal Nature.